Yes, I have red cabinets. That was my summer project from last year. They were normal, builder grade oak cabinets so I wanted to update them to match my home. I took everything off. The doors, drawers, pulls, and handles. First came the cleaning. Grease from 1989 is not pretty. Second, I took everything outside and sanded the doors and drawers. For the body of the cabinets I used my orbital sander that has a filter to catch the dust. Michael added bead board to the exposed sides and we really like the way that turned out. I primed everything and then painted them RED! Valspar Heirloom Red in their signature, high quality, latex. 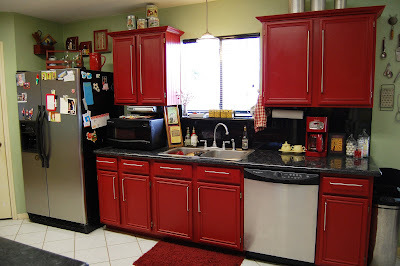 The black granite counter tops were here when we bought the house and I think the red cabinets make them stand out. I love anything old. I think you know that by now. I've decorated my kitchen with some old kitchen utensils, cans, tools, etc. Kitchen table to be painted soon!!!! 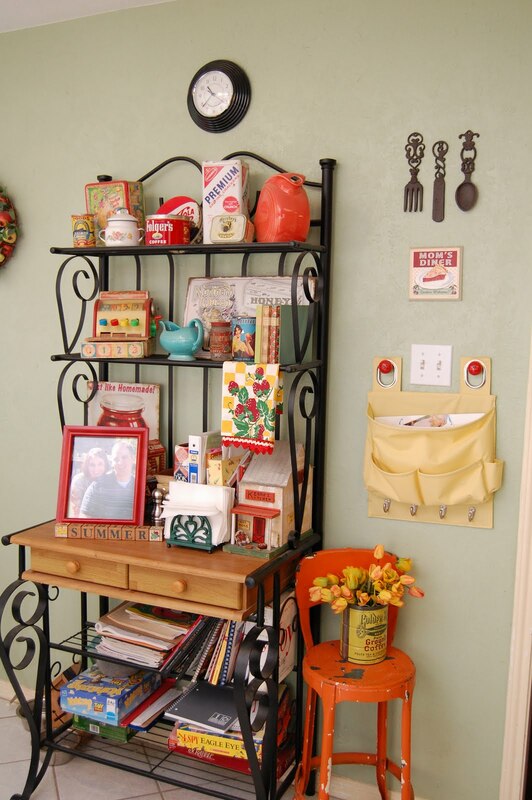 One of my favorite things in this space is my wooden Fisher Price cash register! (middle shelf) I found this at my antique store and seriously, I think I almost started crying. It is one of the first ones they made. Real wood, nails, and everything. The orange stool is from my Meemaw's house and we used to sit in it when we were little. Good memories. My Kitchen was featured here! What a great kitchen! Thanx for sharing this treasure!! What color are you going to paint the kitchen table?? 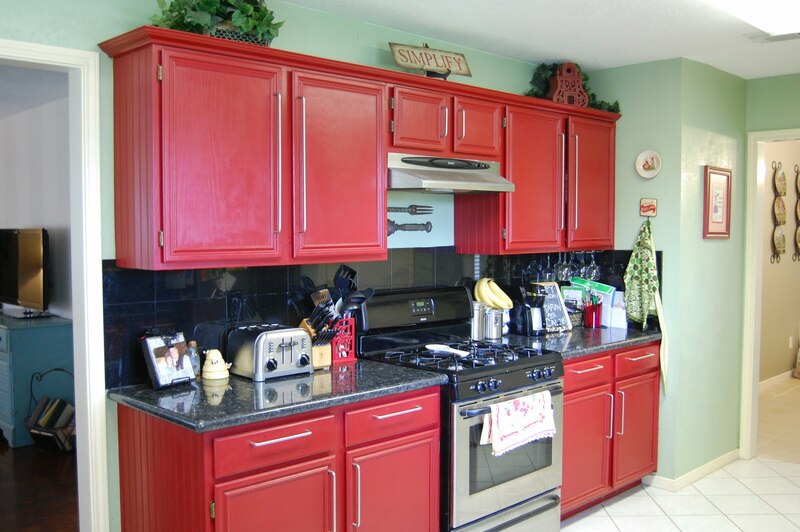 Loving the red cabinets... I live in a rental and would so love to paint these ugly things! can't wait to see the table complete! I love old things too! Love it! I am a new follower and would love it if you stopped by and became my newest follower! I am having a giveaway too! Oh my gosh I love the orange stool! It is adorable..the cabinets look great! I have always loved red! love the cabinets! 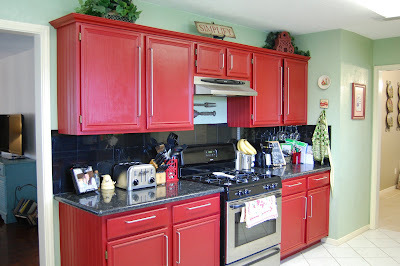 I have been dreaming about painting my cabinets a bold color as well. Thanks for being so brave!! The result is amazing! What a bold color! Love it! love love love the red! great job! Love the red! A perfect color for kitchens. I'm sending this to my sister who wants to do a color on her cabinets as well. Thanks for sharing! Gotta love red! 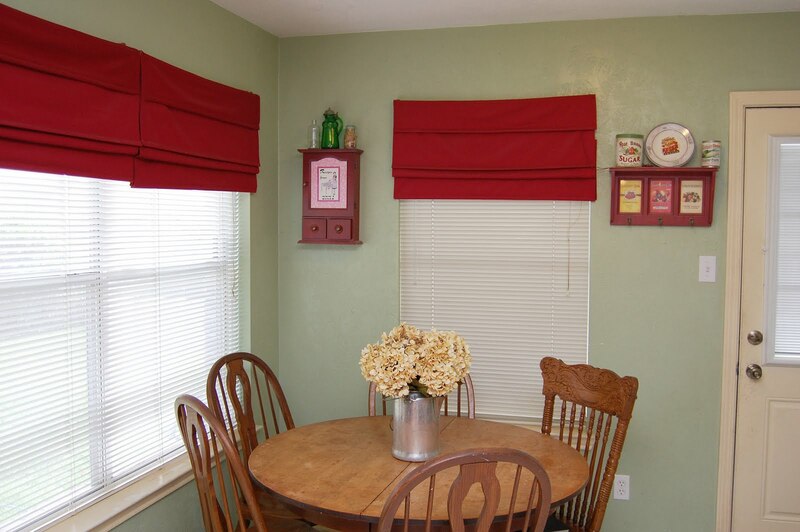 I have had red in my kitchen for years. Way way back I had blue cabinets. What color are you painting the kitchen table? Curious because that is my next project. I am hosting my first party next Wednesday and you are invited! 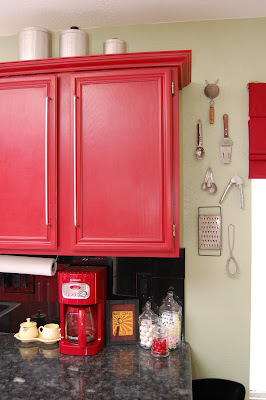 LOVE your red cabinets!! Outstanding! I too have red in my Kitchen , on the walls and border but have white cabinets which we just painted along with the entire Kitchen! The red really makes your kitchen stand out! love the color combo! Your kitchen is filled with personality. Love your red cabinets and all your old things. Can't wait to see what color you're going to paint your table. Hello my friend! I just knew you would have some good pointers on cabinets....we will be overhauling our TN kitchen in the next few months. The orbital sander with vacuum was a great tip! How's the fam?? I love your bakers rack! I have been looking for something just like that, where did you get it from? Interesting and useful information that you have provided here on your post.Thanks.